We're working a private party tonight. A 50th anniversary at a private home. The couple saw us in a night club. I'll be taking Aunt Sally and Uncle Sweeter Dabney, who is all decked out here in his party duds. When I was building Uncle Sweeter I said I wanted a checkered jacket for him. 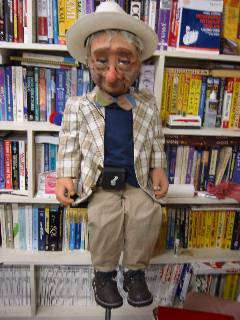 The jacket and bow tie in this picture came in a package from fellow ventriloquist and figure builder, Larry LaFontsee. Thanks, Larry. My wife Judy did the alterations. She shortened the sleeves, made the slit in the back, and made a special slit for his left arm and hand control. He just needs to wear that hat. It's hard to keep such a hat on a dummy during a performance, though, so he now has a hatpin going straight through his skull. Now all he needs are Argyle socks. Hope the show went well. I went shopping at the Salvation army for a nice suit for "Pops." You can really find some nice cloths for a little bit of money. I cleaned up last week with a couple of outfits. Uncle Sweater looks like a real card. You should be happy with him.